Twain's opposition to incipient imperialism and American military intervention in Cuba and the Philippines, for example, were well known even in his own time. But the uncensored autobiography makes it clear that those feelings ran very deep and includes remarks that, if made today in the context of Iraq or Afghanistan, would probably lead the right wing to question the patriotism of this most American of American writers. In a passage removed by Paine, Twain excoriates "the iniquitous Cuban-Spanish War" and Gen. Leonard Wood's "mephitic record" as governor general in Havana. 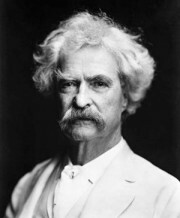 In writing about an attack on a tribal group in the Philippines, Twain refers to American troops as "our uniformed assassins" and describes their killing of "six hundred helpless and weaponless savages" as "a long and happy picnic with nothing to do but sit in comfort and fire the Golden Rule into those people down there and imagine letters to write home to the admiring families, and pile glory upon glory."